Our exclusive TrueColor pinball plastic protectors are a new twist on the traditional pinball plastic protector. We have a two part process where the middle of our protectors are cutout and the outside are a cool color of your choice. This adds a really nice effect to your game while keeping the pinball game's plastic color the original color. 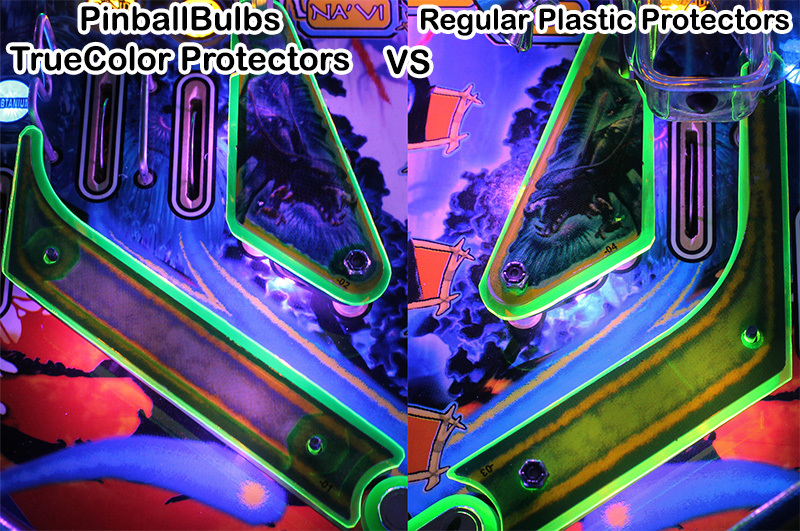 Normal pinball plastic protectors severely discolor the plastic because it is one solid color. TrueColor Pinball Protectors solve this and look great while still protecting your game's original plastics! We currently offer 41 sets of pinball plastic protectors. Don't see your game? Contact us to send a scan of your plastics if you are looking for a set we don't yet have and receive a discount on your next set! This is a hobby for us so we only run the laser and ship once or twice week usually on Mondays and Wednesdays.